Monitoring temperatures and allowing the user to adjust the fan speed pretty much sums up the function of most fan controllers on the market. The only way manufacturers manage to separate themselves from the rest of the crowd is with looks - and I can certainly attest to seeing some wacky designs over the past few years. The SF-609 is built on a rugged steel frame with the front of the unit being a combination of clear acrylic plastic and anodised aluminium with hex bolts holding everything together. All buttons and knobs on the unit are made out of plastic, but feel fairly sturdy and don't exhibit any of the 'tackiness' often felt on other fan controllers. Around the back of the SF-609 we have headers for four 3-pin fans, a single floppy connector for power and an array of 6 pins for use with the included thermal probes. Changing the plexiglass and aluminium panels on the front of the unit is a doddle and can be performed by unscrewing the four hex bolts on the front of the display. The panels then simply lift off, making it very easy to change the look of the unit without even needing to remove it from your PC case one it's installed. The only minor gripe I have with this feature is that it's very easy for dust to find its way in between the plexiglass and aluminium panels requiring regular cleaning to look its best. Not much can really be said about the installation of the SF-609 as it is pretty much fool proof. Simply connect your fan cables to the back of the unit, place the thermal probes in positions on around your PC where they are needed and install the screen in the same way as you would a CD-ROM drive or other 5.25" device. • T Button: Toggles between the four temperature sensors (CPU, Hard Disk, Case & Power Supply). 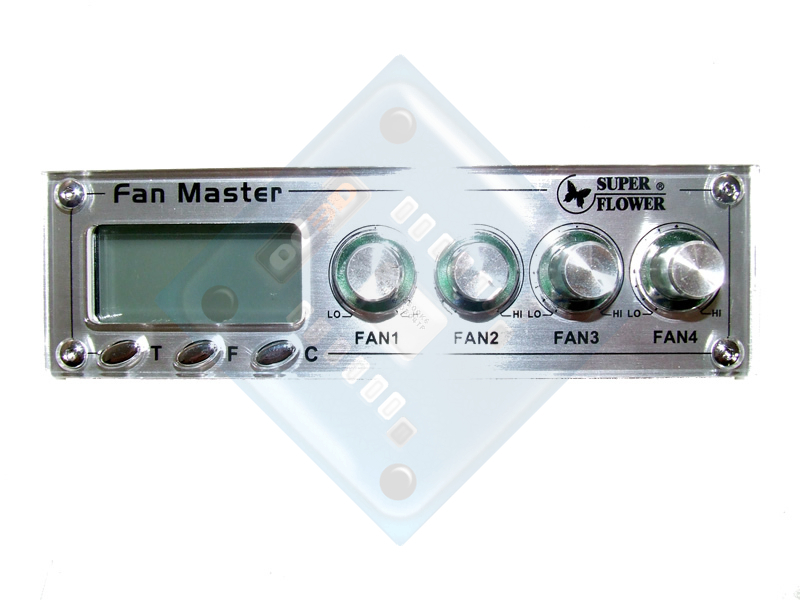 • F Button: Toggles the RPM readout from each of the four fan headers on the unit. • C Button: Changes the screen colour. 6 colour modes, Auto mode (changes colour every 3 seconds) and Off. • T + C Buttons: Clear all custom settings and return unit back to manufacturers defaults. • T + F Buttons: Adjust alarm temperature of the four sensors. This setting is saved in the device even after power failure. • Fan Knobs: Turn clockwise or anti-clockwise to increase or decrease the speed of the fans. With the knob turned fully to the left the voltage output is ~6.0v, fully to the right gives ~12.0v.